Waterside Shops presents A Season of Giving featuring the Giving Tree Silent Auction. This seasonally inspired auction offers ten tabletop holiday trees designed by The Garden District. Each tree is paired with an exclusive retail partner gift to benefit local non-profit organizations, including Naples Botanical Garden. Bring the beauty of Naples Botanical Garden into your holidays this year with this creation by Rufino Hernandez of The Garden District. The winner of this 40” holiday tree will also receive a Lilly Pulitzer gift package valued at $750. 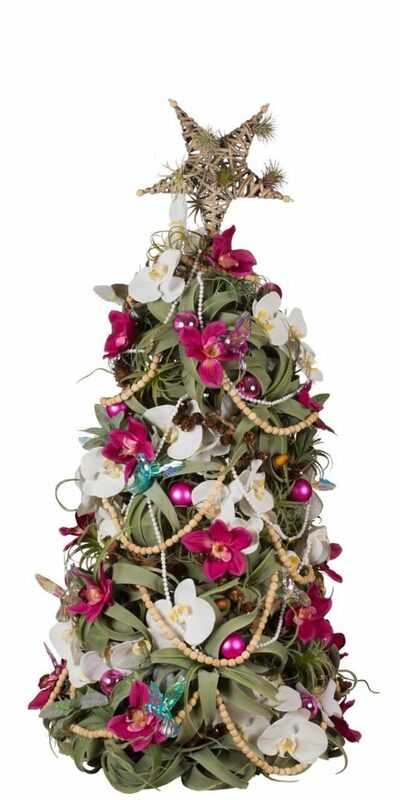 Inspired by the designs of Lilly Pulitzer, this tropical tree includes exotic faux air plants and epiphytes, silk pink cymbidium and white philodendron orchids, a natural bead garland, pine cones adorned with crystals, and delicate glass hummingbirds. A striking tree-topping star, sprinkled with delicate air plants, adds the finishing touch. Proceeds from the auction of this Giving Tree benefit Naples Botanical Garden. See this tree in person at Waterside Shops in the festive holiday window near Louis Vuitton. • Opening bid begins at $250, all bids must be in $250 increments. • (Buy It Now) option available for $5,000! • Auction closes at 12:00pm EST on Thursday, December 6. • Giving Trees will be delivered to the top bidder by appointment only, by contacting 239.598.1605. Delivery is exclusively available for local, Naples addresses.